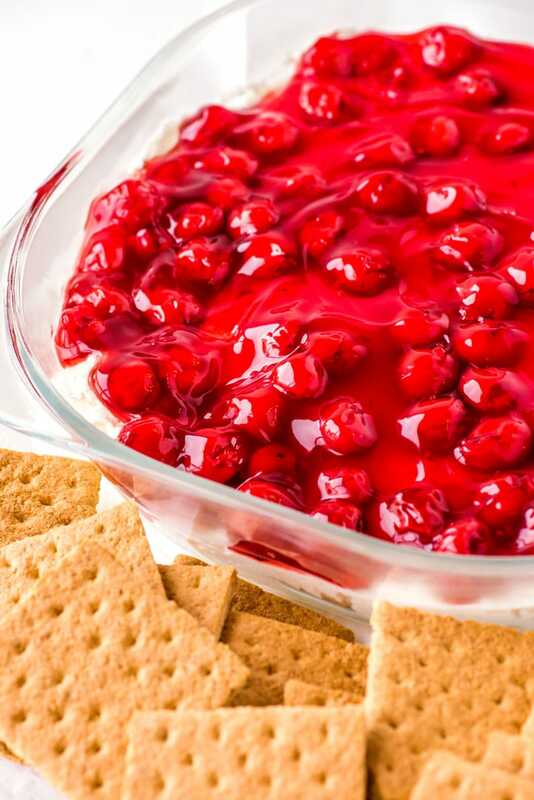 Have the taste of classic cherry cheesecake to your party without all the trouble thanks to this easy four-ingredient cherry cheesecake dip. 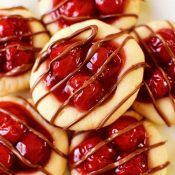 Perfect to make in advance and easy to customize with different cookies or crackers. Hosting a party is fun and all, but the food can be a bit of a hassle. Between the timing and the dishes and all the extra work, sometimes it’s a challenge to even enjoy the party you’re throwing. But that, my friends, is exactly why I love appetizers. And, more accurately, dessert dips. Because there are very few things easier (or pretty or delicious!) 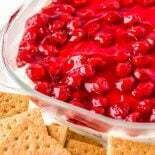 than whipping up this cherry cheesecake dip with graham crackers. 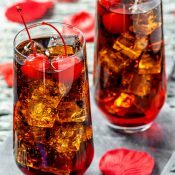 How do you make cherry cheesecake dip? 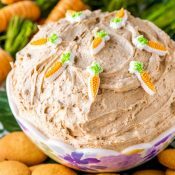 First and foremost, it’s important to note that this is a no-bake dip. So there’s no need to preheat the oven, or worry about where to store a hot plate on your table, or fret about how the dip is growing cold and no one’s eating it. All you have to do is mix, layer, and go. But what exactly are you mixing? This dip has a pseudo cheesecake base made of marshmallow fluff, cream cheese, and cool whip. These are mixed together until creamy and layered at the bottom of a wide dish about (I’d recommend about 8×8 inches in size). Then, to top it all off, a whole can of cherry cheesecake filling is spread on top of the cheesecake layer. For those of you counting along at home, that means this delicious dip only has four ingredients. 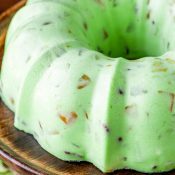 What to eat with dessert dip? After making so many dessert dips, I have a whole list of options that go great with these creamy treats. Feel free to try one (or many!) 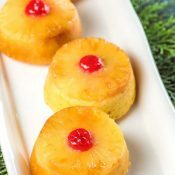 of these with your cheesecake dip. And the list could go on and on. If you find a new combination for dipping, I’d love to hear about it in the comments! You can use any serving dish you’d like for this treat, but I think it works best in a clear dish. That way your guests can see the layers of the dip. 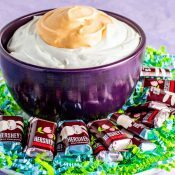 If making this dip in advance, I’d recommend whipping the three cheesecake ingredients together (cream cheese, marshmallow fluff, and cool whip), layering them in the bowl, then chilling the bowl. 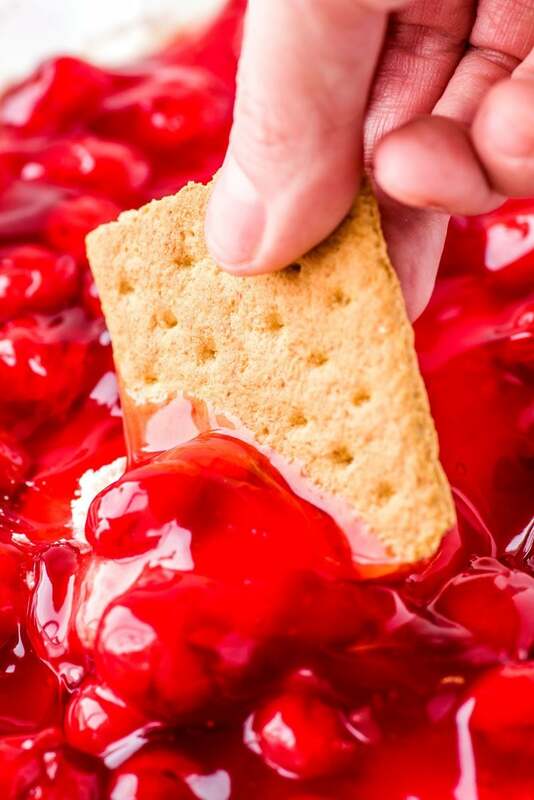 Wait to add the cherry pie filling on top until you’re ready to serve the dip. This will ensure that the filling and the cheesecake layer don’t mix or absorb too much. One of the best parts of this dip is the distinct layers and flavors, so do what you can to preserve them! 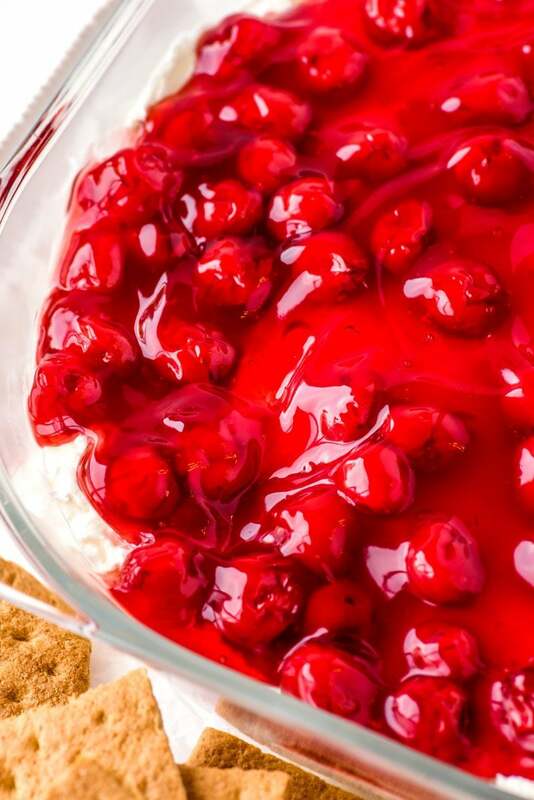 Have the taste of classic cherry cheesecake with this easy four-ingredient cherry cheesecake dip. Easy to make in advance and served with your favorite cookies. Using a stand mixer (or a hand mixer + large bowl), add in cream cheese and marshmallow fluff and beat on medium high speed until smooth and cream cheese is completely incorporated (no clumps), about 7-9 minutes. Remove bowl from mixer. Add in cool whip and use a spatula to gently fold ingredients together. Pour cheesecake mixture into a wide dish (I used a 8x8 baking dish) and spread into an even layer. Scoop cherry pie filling on top and gently spread to cover cheesecake layer. 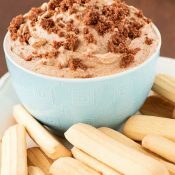 Serve dip immediately with graham crackers or cookies for dipping. I have the perfect glass bowl to serve this in… and honestly I dont know if I like that its no bake or how pretty it is when serving better! 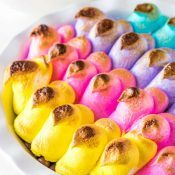 I tried it with blueberry pie filling and we loved it! Use your favorite flavor!